Manual citrus juicers are the perfect solution if you enjoy drinking fresh juices from citrus fruits such as oranges, mandarins, lemons and grapefruits without too much hassle. A manual citrus juicer is also typically much more affordable (and far less complicated) than a motorized or electric juicer. There are different types of manual citrus juicers, from the very basic squeezers and reamers to the fancier press juicers. What they all have in common is that they require some level of physical effort to operate them. They are not motorized in any way. Your very own muscle power is required to get yourself a refreshing and nutritious drink. But just because you need to use your arms and hands doesn’t mean they can’t produce a delicious juice. They certainly can, for a fraction of the price of a traditional, motorized juicer. In this article I dive a little deeper into the world of manual citrus juicers and select the best models per category. What to Look for in a Manual Juicer? When looking for a compact and affordable manual citrus juicer, you need to work out how basic you want it to be. The most basic juicers are the handheld squeezers. They’re small and very basic but can quickly generate a fresh juice for you. You can also go for a slightly more efficient countertop citrus reamer that can generate a bit more juice without too much effort. Or if you have a bit more budget to spend, a press juicer could be a great choice. Often used in cafes and restaurants, manual press juicers are a bit more advanced and efficient. The models below are featured based on a combination of price, juice yield and easy of use. Other factors taken into account are reviews, manufacturer and product age. First you’ll need to decide on what type of manual juicer to go for, a basic handheld citrus squeezer, a countertop citrus reamer or a commercial grade citrus press juicer. Price is always an important factor when buying a consumer product, as you need to get the best value for money. Cheap is not always the best choice, just like expensive doesn’t always mean it’s good quality. Juice yield essentially means how much juice a given manual citrus juicer is able to extract from a fruit at normal effort. The more yield, the better. Ease of use is also an important factor with manual juicers, particularly when physical labor is required to get that juice out. How easy, or difficult, it is to clean the juicer also falls under this same criteria. Here are 6 of the best manual juicers available on the market today, categorized by manual lever/handle press juicers, countertop citrus reamers and handheld squeezers. 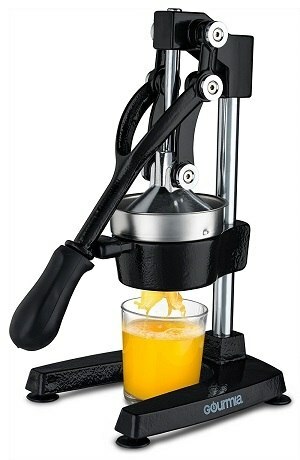 Manual press juicers create juice by pushing down a lever or a handle. This movement efficiently squeezes juice out of fruits with a pressing mechanism. A well-designed press juicer doesn’t require much physical force as the power is generated by the mechanics of the juicer. Commercial grade manual press juicers are used in cafes in restaurants that serve up fresh orange juice. They are highly efficient manual juicers that can create with great flavors and high yield. Keep in mind though that some of these juicers are on the expensive side. This commercial grade manual citrus juicer by Gourmia offers excellent value for money. A top quality device, perfect for use at home as well as for in commercial environments. Small to normal sized fruits don’t need to be cut in half. Simply place the whole fruit in the holder and use the large handle to squeeze delicious juice in a glass that you can place underneath. A strainer keeps the pulp out of the actual juice but can be added later on if desired. The Gourmia is very robust with stainless steel material and a cast iron base and handle. 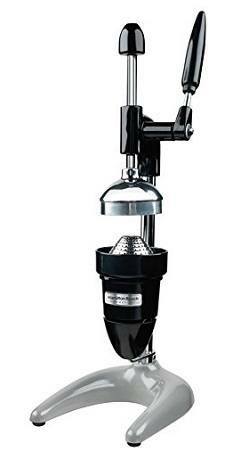 It also has suction cup feet that allow you to secure this juicer on your kitchen countertop for better grip. The Hamilton Beach 932 stands out as a manual citrus juicer in the fact that there is hardly any physical force required in order to operate it. This juicer has a arm, rather than a handle, that needs to be rotated a couple of times to get the juicer out of the fruit. The extractor arm generates a force of up to 2000 lbs. to ensure maximum juice yield with minimum pulp and skin oil. This Rack-and-Pinion type gearing results in improved performance and more leverage with less effort. 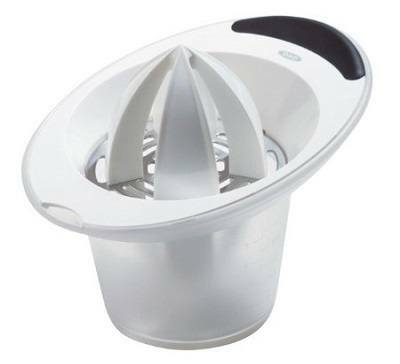 The strainer cone and funnel can be removed for easier cleaning. The heavy-duty metal construction with acid-resistant chrome gives this juicer a very robust feel. This commercial grade citrus juicer is highly efficient, producing perfect juice with high yield. In addition, this device is easy to use and clean and is made with top quality materials. Citrus reamers come in two varieties: handheld and countertop. I personally find the handheld citrus reamers a pain to use so I’m not including them here. The countertop citrus reamers are very affordable and super easy to use, but do require a bit of physical effort to achieve a good juice yield. Using it is easy. Simply cut a (citrus) fruit in half, press and rotate against the ribbed cone in the middle. With a manual citrus reamer it’s important that the cone has a pointy design. Some of these models have rounded edges and angles which doesn’t benefit the juicing process. While they do typically produce juice with some pulp, manual citrus reamers are able to very quickly produce juice that is tasty and nutritious. In addition, cleaning is very easy. With a 5 ounce/148 ml capacity, this compact manual citrus juicer is designed with quality and convenience in mind. The actual reamer has perfectly shaped angles for the best possible juice output. The base is made with glass and all plastic parts are BPA-free and dishwasher safe. What’s great about this citrus juicer is that the container is designed as a cup (with lid) so you can drink from it straight after juicing. Alternatively, you can put the lid on top and store it in the fridge for later. In addition, the reamer includes an integrated pouring spout for quick and easy pouring into any cup. Super convenient. This simple yet convenient citrus juicer by OXO features two reamers suitable for small and larger fruits. The plastic container has measurement markings so you know exactly how much juice you have produced. The soft and non-slip grip makes squeezing and pouring a comfortable and hassle-free task. All parts can easily be disassembled for easier cleaning. 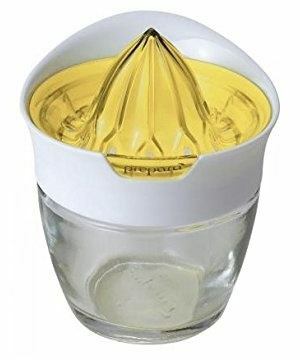 The mechanics of a handheld citrus squeezer is that same as with a commercial grade press juicer. Instead of rotating (one half of) the fruit as you do with a reamer, a handheld press juicer squeezes the juices out of the fruit by pressing hard. As a result, the juice typically contains far less pulp than a juice made with a reamer does and as such tastes sweeter. Handheld squeezers are very cheap, small, efficient, easy to use and also easy to clean. 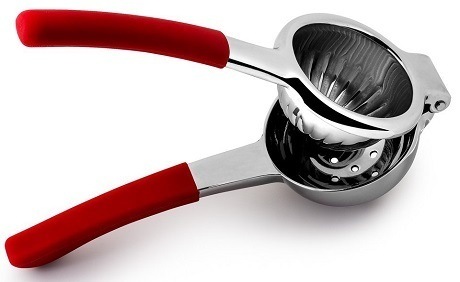 One of the best selling and highest rated manual juicers is the stainless steel lemon squeezer by Bellemain. The conveniently thick, silicone-made handles keep your grip strong, allowing you to apply more strength which in turn results in better juice yield. The best feature of this citrus juicer is its powerful stainless steel design that will make it last forever. Cleaning is also a breeze, but if you really need to, you can also safely place it in the dishwasher after use. The last one in this list of best manual citrus juicers may be a very basic model but it’s also one of the most popular citrus squeezers available. 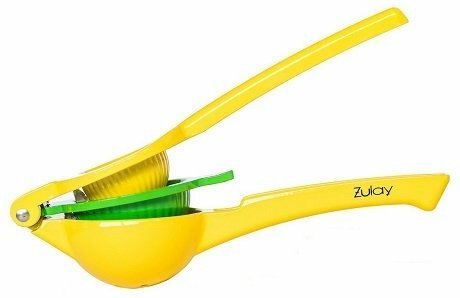 This metal made citrus squeezer by Zulay can handle limes, lemons and even smaller sized oranges. The yield is maximized with the strength applied by the comfortable handles. The juice created by this Zulay model is free from seeds and pulp. Available in bright yellow and pink. Triturating Juicers Explained – Are They Worth Your Investment?